Oh my goodness, you guys. Nutella Brownie Bites. You know me. I love a good excuse to bake goodies, especially when those baked treats contain chocolate AND Nutella. When I was trying to think of something I could bake that would be a perfect book club treat (based on this post I did for the book This is Where I Leave You – NOTE: this is not a sponsored post), I saw a picture on Pinterest that I thought would be a lot of fun. I mixed up my normal brownie batter with one alteration – I substituted Nutella for the chocolate chips that my recipe called for. That first batch completely flopped (I tried making brownie bowls. They were a mess!) but the brownie-disaster tasted unbelievably delicious. My husband and I polished off the scrapings of the muffin tin (at least the part that didn’t end up charred on the bottom of the oven) and I vowed to try again. Same amazing taste….but these didn’t end up as oven ashes. 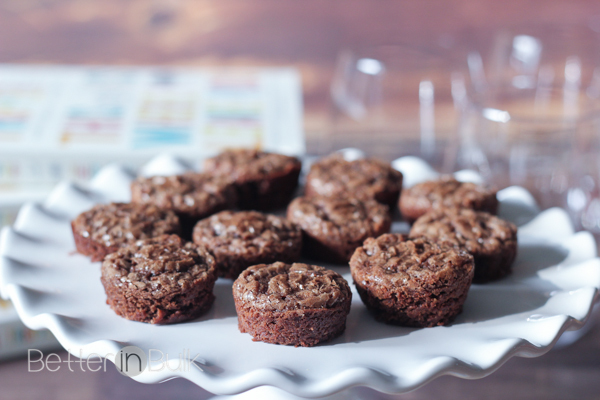 Brownie bites – especially brownie bites that taste THIS good – are perfect for parties (or book clubs) because they are easy-to-handle single-servings. I will be making these again and again! Heat oven to 350°. 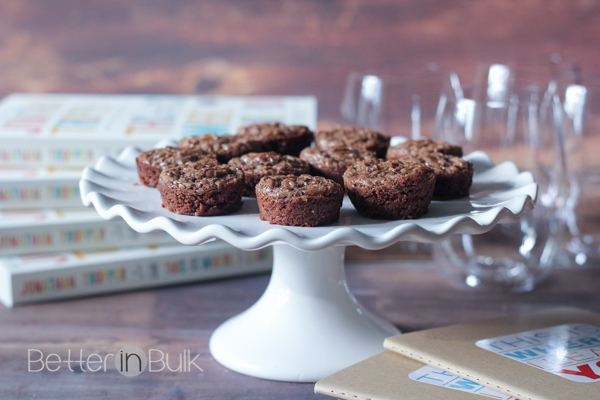 Grease mini muffin tin (or use mini liners). In medium saucepan over medium-low heat, melt butter; turn of heat. Add sugar, vanilla, and eggs; blend well. Stir in flour, cocoa, Nutella, and salt; mix well. 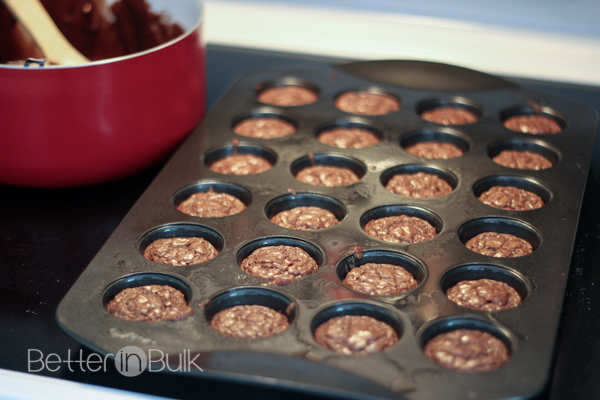 Scoop into mini muffin tins; fil each cup about ⅔ full. Bake at 350° for 12-15 minutes. Cool completely in muffin tin. When cool, remove carefully, loosening sides with butter knife if needed. Note: one thing that I will do differently next time is that I will use mini cupcake liners for sure. Much easier to get out of the baking dish. Or I’ll use a non-stick silicone muffin dish like this one. This recipe makes about 48 mini brownie bites. These sound so good–love that they are mini too! Thanks for sharing at Funtastic Friday! These would be dangerous to have around because I would eat them all. 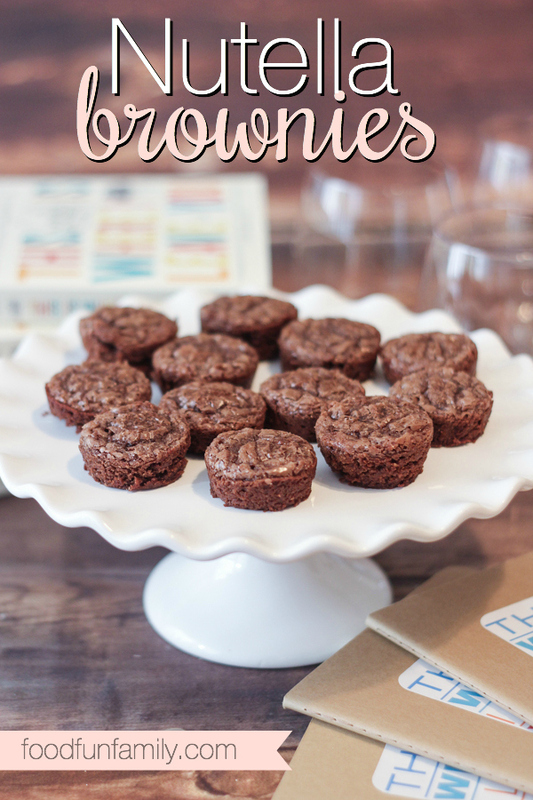 Thanks for sharing your brownie bites recipe on Merry Monday. Pinned. Ahh… these look really good. I want to take all these now! :D Thanks for sharing & have a lovely week! Yummy! These little bites look incredible and so delicious. Thank you for sharing. PINNED! That is such a great idea! I love having bite-sized snacks on hand for whenever the craving arises! This looks delicious, I cannot wait to give it a try. I tried Nutella for the first time a few months ago. How could I have lived for so long without knowing about something so delicious? Thank you for sharing this recipe. These are so wonderful. You know you can make a variation on this which is pretty good with Almond Butter and Melted Chocolate chips too. i need to make these for my mom! Oh these look so very yummy! I love any kind of brownies. I love the individual sizes these are in, perfect for serving.